This is a book about love-about compassion, selfless service, and man’s humanity towards man. It is about a hospital born of love, whose very bricks were formed with love, and whose mortar was mixed with the sweat of loving service. 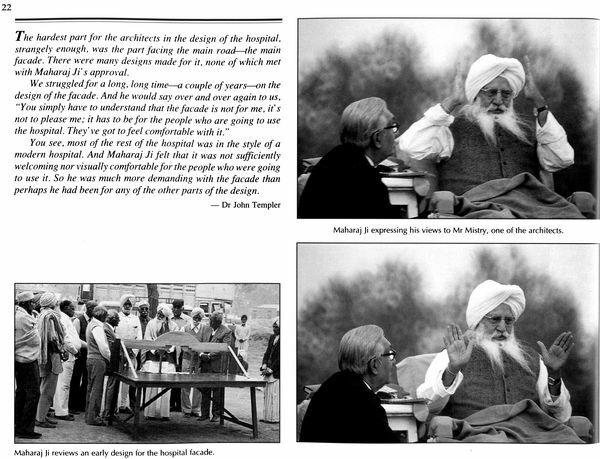 The Maharaj Sawan Singh Charitable Hospital was conceived and built on these virtues, and through its free medical treatment to the suffering rural poor of northern India it continues to be a medium through which this love and compassion find expression. To understand what is meant by a ‘labour of love’, we first need to consider what love is, in its noble and pure form. There are as many expression of love as there are people who possess it. To love someone is to feel a deep and tender affection towards that person. To love humanity is to possess a feeling of brotherhood, goodwill, and compassion for all. It is often said that God is love, that love is the nurturing and sustaining force of the whole creation. As a direct expression of this love, the Lord sends saints into this world to teach humanity the path back to God, the path of love. Saints or perfect Masters, through their love for all things and their compassion and service to the Lord’s creation, hold a mirror to that same potential which lies within each one of us. For most of us, however, this potential remains dormant or buried beneath the dross with which we clothe ourselves by living blindly and selfishly in the world. By their present and example, saints awaken the most noble human qualities in those people fortunate to come within their influence. Love and humility then flow from the disciple to the Master in gratitude for this incalculable treasure. The disciple for love then begins expanding to embrace all of God’s creation because he sees God in everyone and everything. He is natural moved to do those things which please God and please his Master. Indeed, it is this very process which at the heart of this ‘labour of love.” The Maharaj Sawan Singh Charitable Hospital, the annual Dera Eye Camp, and other charitable activities of the Maharaj Jagat Medical Relief Society all arose from the overflowing love and compassion of Hazur Maharaj Charan Singh, the spiritual head of the Radha Soami Satsang Beas from 1951 to 1990. Hazur Maharaj Ji was always moved by the tragic condition of mankind and, in particular, by those people who have no voice of their own and who suffer all their with no hope for improvement. 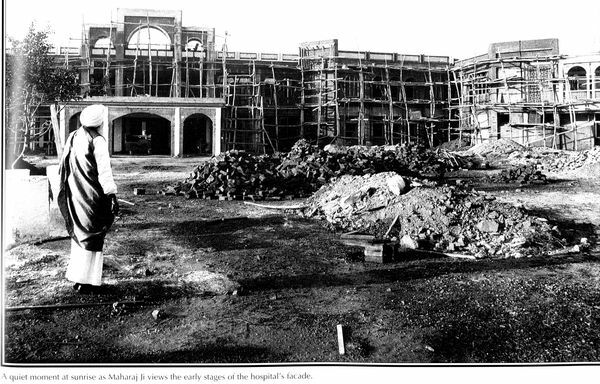 It was this compassion, this overflow of love, embodied in the most beautiful and magnetic person of Hazur Maharaj Ji, that provided the impetus, the pivot, the functional cornerstone for the creation of this hospital-an edifice for charitable activity in the purest sense of the word. 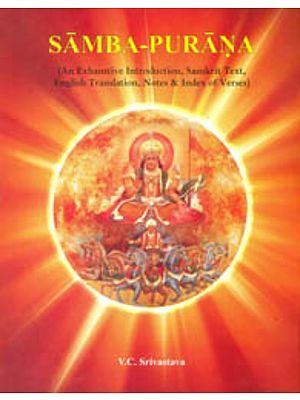 To comprehend this phenomenon (for it is indeed a phenomenon in this age of profit-motivated action and materialism), we present this book, Labour of Love, to show how the saints, and in this particular case, Hazur Maharaj Charan Singh, devote themselves without restraint to the uplift of mankind and kindle an all- embracing fire of love and compassion in the hearts of those around them. A Brief History Maharaj Charan Singh was fourth in the line of succession of the spiritual Masters at Dera Baba Jaimal Singh at Beas in Punjab. Baba Jaimal Singh was the first Master to settle at Beas, and it was after him that the colony was named. He settled at this secluded spot on the banks of the Beas River after his retirement in 1889 to live a quiet life of meditation. Though the place was remote and surrounded by ravines and wilderness, a group of seekers soon began collecting around this noble soul. A potable water had to be brought from the neighbouring village at considerable inconvenience in 1896 Maharaj Sawan Singh, Baba Jaimal Singh’s beloved disciple and successor, persuaded him to sink a well. Later, a small room was built for Baba Ji’s accommodation another for holding satsang (spiritual discourses). As the congregation grew, another community room was erected to meet its needs. These few simple structures, built through the service or seva of a handful of disciples, were the seeds of the colony at Beas. In 1903, Baba Jaimal Singh passed away transferring the mantle of mastership to Maraj Sawan Singh, who was then serving as an engineer in the Indian Army. In 1911 Mahraj Sawan Singh took early retirement and shifted to the colony, now known as Dera Baba Jaimal Singh. The seedling planted by Baba Jaimal Singh was growing. For almost forty years, Maharaj Sawan Singh, affectionatiely known as the Great Master, travelled extensively throughout northern India, in much of what is now Pakistan, spreading the light of love and mercy and putting thousands of souls onto the path of self-and God-realization. During his years of selfless service, the attendance at satsang and the number of residents at the Dera kept on increasing. At that time there were no regular arrangements in the colony for medical care. This changed in 1932 when Dr Julian Johnson, an American surgeon, settled at the Dera to be near his Master, Maharaj Sawan Singh. Dr Johnson rendered all types of free medical services, including surgery, to the people in and around the Dera. He also acted as personal physician to the Great Master. After his death in 1938, Dr. Johnson’s duties were taken over by Dr Chander Bansi, a retired civil surgeon of the Punjab government. The Dera continued to grow and change. After the Passing of Maharaj Sawan Singh in 1948, he was succeeded by Maharaj Jagat Singh, a retired vice principal of Lyallpur Agricultural College. Maharaj Jagat Singh, also known as Sardar Bahadur, was a serene person with an incisive, scientific mind, mellowed by a depth of feeling and compassion. All through his cereer he had supported numerous students and others through anonymous financial help. Most of those who profited from his generosity never knew who their benefactor was. It was, therefore, in the fitness of things that his spiritual successor-Maharaj Charan Singh-chose to adorn the charitable medical relief society with his name. Following the passing of Maharaj Jagat Singh in 1951, the mantle of mastership was Maharaj Charan Singh. A graduate in law, Maharaj Charan Singh came from an agricultural family. More important, however, was his close association with the Great Master, who had raised him at the Dera from a very young age. The influence of the Great Master’s love compassion, and mercy was immeasurable. Through the direct example of the Great Master, the path of the saints (Sant Mat) was imparted to him. About this relationship Maharaj Ji once said, ‘I know Sant Mat through the Great Master-he was the path for me, there was no other teaching but the Master. just accepted the Master, and whatever came from him became my teachings.” Since all that he considered precious came to him through the Great Master, it is not surprising that Maharaj Charan Singh dedicated the Charitable hospital to his Master-a hospital whose very existence is a daily blessing to all who seek help within its walls. The large modern hospital at Beas was not the first medical endeavor to carry the name of the Great Master. In 1958, because of the steady growth of the population of the colony at Dera and the increasing number of people attending the large bhandara (anniversary) satsangs, a small charitable hospital named the Maharaj Sawan Singh Charitable Hospital was established in the colony. This small hospital had grown and improved its services over the years and today continues to provide medical care for the Dera residents and for the sangat (community) during bhandara times times. With the establishment of the new, larger hospital in Beas, which was also named the Maharaj Sawan Singh Charitable Hospital, the smaller hospital at Dera has been renmed the Dera Hospital. Also located within the colony are the homeopathic cure clinics. These facilities have been running successfully for many years and have enhanced the range of free medical service offered of the Dera residents. The same spirit of love which motivated these medical services has led to the Dera’s involvement in other medical activities. 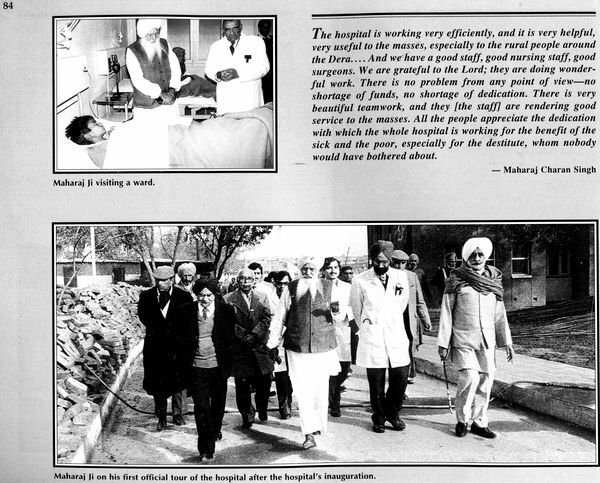 In 1962, at Maharaj Charan Singh’s specific request, the Dera established a blood bank through which the sangat donated generous amounts of blood to the Punjab Government’s emergency blood collection programme. And, starting in 1965, the Dera began holding annual eye camps for the free treatment of cataracts and other eye diseases. Now in the 1990s, more than 10,000 poor villagers come every year from all over rural Punjab and neighbouring states to receive treatment. First they are all given careful medical screening and treatment of any secondary medical conditions. They are also provided free food and lodging conditions. They are also provided free and lodging during the week of convalescence after their operation. In 1993, over 7,000 eye surgeries (mostly for cataracts) were performed free of charge over the three-week period. More than 7,000 sevadars (voluntary workers) contributed their time, their skills, and their love in caring for the patients. Among them were more than 250 doctors, nurses, and technicians who donated their professional services. In many ways, it was the dire need of the people who attended the annual Dera Eye Camp, and the dedicated service rendered to them by the sevadars, which formed the nucleus from which the permanent hospital facility grew. 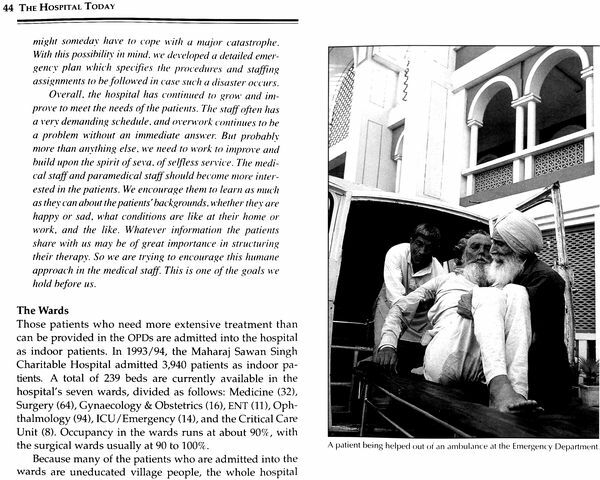 Through the annual eye camps Maharaj Charan Singh and the Dera management became increasingly aware of the extent and seriousness of the medical conditions of the villagers from the surrounding area. From the very first camp, thousands of people would come in need of medical treatment. To the distress of Maharaj Ji and the doctors, many had to be turned away because their medical problems were too severe and complicated for treatment at this type of temporary facility. The number of people who had to be turned away kept increasing over the years as the number of those seeking treatment continued to grow. The sevadars were always disturbed by having to turn away such poor and needy people, knowing that no adequate medical facilities existed nearby to which they could turn. 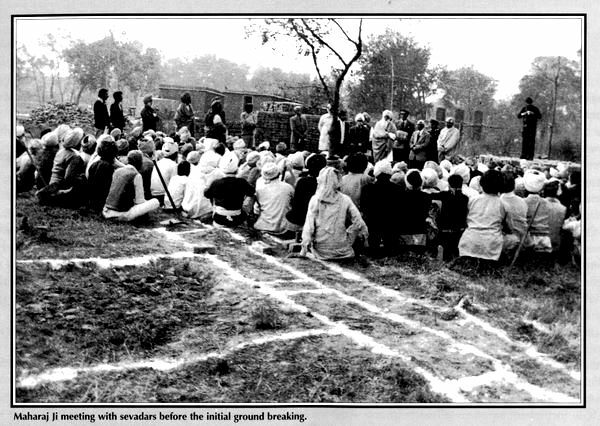 In 1978, out of concern for the welfare of these poor villagers, Maharaj Charan Singh called for a committee to begin planning the construction of a 100% charitable hospital that would provide free medical care all year long and would serve all people equally. It was to be a rural-oriented hospital but with top- quality medical facilities, where-though the treatment would be free and the majority of patients poor-every patient would be treated like a VIP. 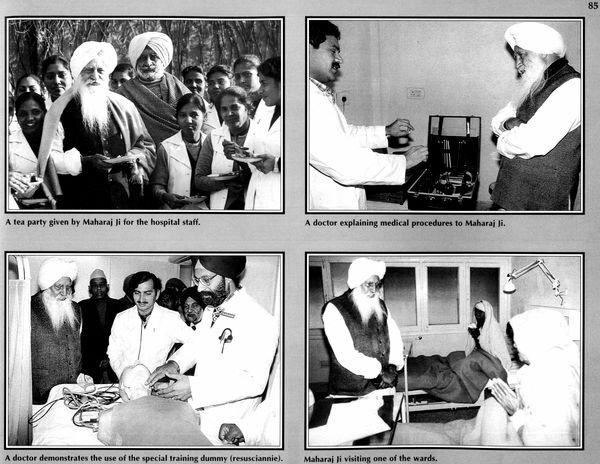 The Maharaj Jagat Singh Medical Relief Society Beas was established in 1978 with its registration under the Societies Registration Act. Its aim was to oversee and coordinate all charitable medical activities already taking place at Dera, and to expand upon these activities both in and outside the Dera. The Society started functioning with Maharaj Charan Singh as the Patron and he was succeeded as such by the present Master, Maharaj Gurinder Singh. 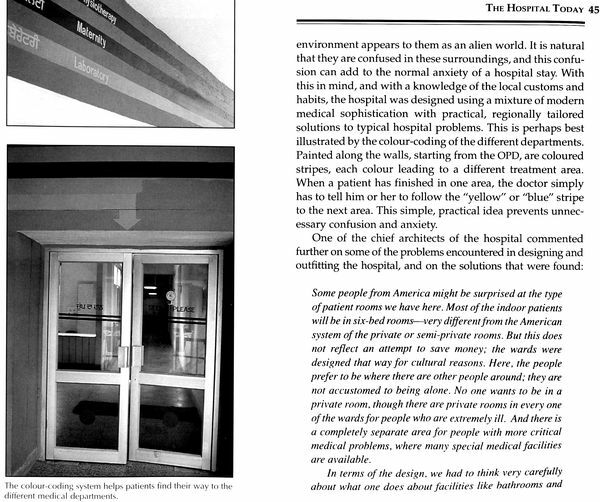 Conceived as secular in nature, the Society’s the promotion of free medical care for all. The Memorandum of Association of the Society provides for the following aims and objectives, stipulating that expenditure on these objects shall be incurred without consideration of the caste, creed, colour, status, or religion of the recipient.